Attic Manager has ability to create a hierarchy of locations. For example, at the top level, you can have your house, your office at another location, perhaps your holiday house, cottage, garage, etc. At the second level would come all the rooms in each house; at third level you can even divide stuff into closets and maybe even go for level four with individual drawers. This is all up to you. If you run a business, you might even have multiple offices and you can track it all in a single database. However, you might want to share some of the data with other people, and it wouldn't be good to keep all information in a single database. For example, you might have a co-owner of your business, who should have access to office inventory, but not your home inventory. In this case you should have multiple Attic Manager databases. 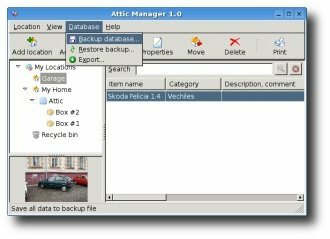 Installing multiple copies means that you would have another copy of Attic Manager installed in a different directory. For example, the one copy could be installed in c:\Attic Manager, while the other is installed in c:\Attic Manager2. 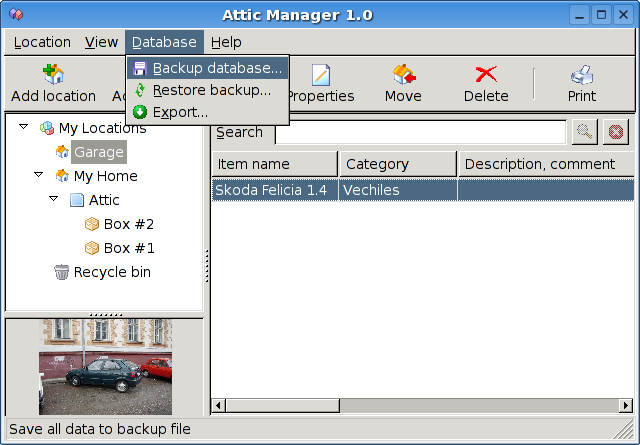 Or even better, something like c:\Attic Manager Home and c:\Attic Manager Office. To achieve this, just start the installer (setup.exe) and select a different location when the install program prompts. Installing multiple copies is recommended, because it is easier to use. You can have multiple inventories open on the screen at the same time. Do not worry about the program size, Attic Manager only takes a couple of megabytes. If you want to run only one instance of Attic Manager, then the only way to use multiple databases is to use backup and restore feature. Any time you wish to switch the database, select the Backup database option from the Database menu and save the file to a safe location. Then restore the other database from backup that you previously created using the Restore backup option from the Database menu. To create additional databases, you should back up your current database and then restore the empty backup file. This empty backup file comes with Attic Manager. It can be found in the directory where Attic Manager is installed. The file name is empty-database.fbk.